Phantasy Star Portable 2 Infinity Officially Released in Japan! Phantasy Star Portable 2: Infinity, the highly anticipated sequel to PSP2 for the Playstation Portable, launched yesterday in Japan. PSP2i offers players an all-new story mode, including tie-ins with PSO's 10th anniversary. The game also includes new features, allowing players to take screenshots, rebirth characters to gain additional stat points, create missions, play with alternate characters as NPCs, and more. In addition, you can import your existing PSP2 characters. We're still waiting for more information on when we might see the game in the US and Europe, but PlayAsia and other import sites now have the Japanese version of the game in stock and available for those of you who don't want to wait! Copies of the game come with a Phantasy Star Online 2 code redeemable for a chance to participate in the PSO2 Alpha Test (though this may end up being limited to Japanese residents). For a limited time, there are also two free item packs available on PSN, containing eight total weapons and clothing items from the item design contests held in Japan. 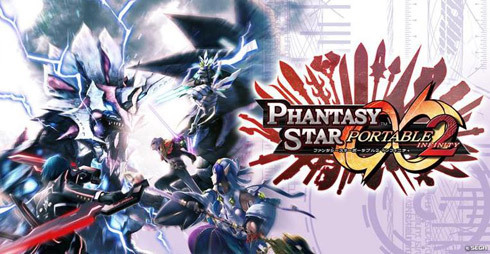 For all the latest information and discussion regarding Phantasy Star Portable 2: Infinity, be sure to stop by our PSP2 forums! 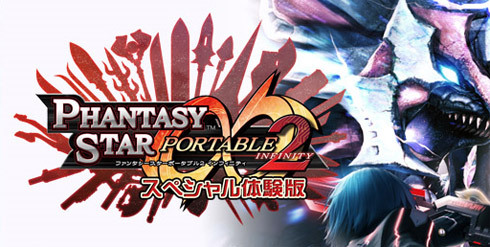 Phantasy Star Portable 2: Infinity Demo Now Available on Official JP Site! It's the day many of you have been waiting for! No, PSO2 isn't out yet, it's the other day you've been waiting for. The Phantasy Star Portable 2: Infinity demo is now officially available! You can now download the PSP2i demo, which weighs in just under 600MB, from both PSN and the official JP website (red button). It is also available on UMD and at select demo kiosks at participating Sega arcades (for those of you in Japan, of course). The Phantasy Star Portable 2: Infinity demo includes some pretty cool features and offers a LOT of content for players to enjoy. In addition to being able to raise your demo character to level 100, you can also raise your types to level 20, experience the new visual lobbies, try the new Infinity Mission system, download missions, participate in collaboration missions, take screenshots, play some battle and challenge missions, customize your room, and enjoy three chapters of the game! In addition, you'll get bonuses for importing your existing characters! Online play for the demo will be enabled starting January 20th, but only a limited number of trial licenses will be available on PSN. For more information on the demo and what features are currently enabled in it, be sure to check out this thread, posted by our very own Mike in the PSP2 forum! The Official Blog indicates that Mirage Blasts are being adjusted so they will be faster and stronger. Credit goes to Mike for bringing us this news. You can share you thoughts in this forum thread. Japanese PSP2 Infinity Demo Set for January 2011! Player level cap will be LV100, battle type cap will be LV20. Play the first chapter of both Episode 1 and Episode 2. Utilize multi-mode, internet multi-mode and the new friend search function. Play the new infinity missions and experience the return of visual lobbies. Includes some collaboration items and additional download missions. Completely transfer your save data from the full version of PSP2 (or PSP2 The Best). Keep in mind that the release date and contents of this demo are both subject to change. Furthermore, downloading the demo will require at least 600MB of free space on your memory stick. Also, the demo and full versions of the game will not be able to play cooperative multi-mode together, and once the full version of the game is released on February 24, 2011, the online demo services will be ended. Thanks to WBMike for bringing us this information. Stay tuned as we await further details on the release of this demo! Siliconera recently previewed several new Vocaloid items that have been announced for inclusion in the Japanese version of Phantasy Star Portable 2 Infinity. As seen below, these items will consist of clothing, weapons, and room decorations. Given the current popularity of the Vocaloid franchise and highly anticipated release of Sega's Hatsune Miku: Project Diva 2nd game, the inclusion of so much Vocaloid content is not surprising. Credit goes to Siliconera for providing the images. You can discuss these content additions to Phantasy Star Portable 2 Infinity in this forum thread. Stay tuned as we await more details on this upcoming title. In the meantime, feel free to join in the ongoing discussion at the forum! Thursday night's live video stream from Sega included a look at Phantasy Star Portable 2: Infinity, showcasing some features and in-game footage from the upcoming title. The live presentation, hosted by producer Satoshi Sakai, was packed full of information about the game. Unfortunately, this was all in Japanese, so we understood about 10 words throughout the entire stream. Keep an eye out for a follow-up story including details from the presentation as we get translations! Hidden, juicy PSP2i details aside, the highlight of the presentation had to be around 18:32, where a promotional tie-in with fast food chain KFC was revealed. 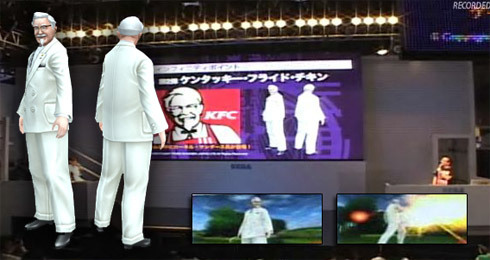 Following the announcement, in-game footage showed Colonel Sanders performing combat moves with his cane, using fire TECHNICs, battling enemies, and just chilling out. Shortly afterward, the PSO: 10th Anniversary video was shown and there was some brief discussion about PSO2 (we'll try to get these details up as well, if there was anything new mentioned). Colonel Sanders in MY PSP2i? It's more likely than you think! A full recording of the stream has been made available on UStream for anyone wanting to feel like the French and Spanish lessons they took in school were a complete waste. Go check it out! The Phantasy Star Portable 2 Infinity opening was posted earlier today during a live show on the nicovideo website. Featuring a new song called "Ignite Infinity," the opening consists of a mixture of new video combined with several snippets from the Phantasy Star Portable 2 opening. One of the most notable aspects of the video is the appearance of Olga Flow and and the Red Ring at the beginning. If you missed the live show, you can watch the opening on Youtube or download the video. Credit goes to Typestatic for uploading the video. Nagisa is not a pirate - at least we don't think so. In addition, several new character designs for the playable races were recently released on the Phantasy Star Portable 2 blog. You can see the new designs here and here. These new designs definitely make a statement. How can he bend his knees? Credit goes to Mike for bringing us news about the opening video. You can share your thoughts about this news in this on-going forum thread. New Race - A new race called "Dumans" are being introduced. They are mutated humans that have an Infinity Blast special attack. Character Redesigns - Existing races will receive visual overhauls. Infinity Difficulty - A new difficulty that is higher than S-Rank. Character Rebirth - The level cap for Infinity will be 200. Once a character hits cap, a "Rebirth" option will appear. Your character level will be reduced 1, but your character will have improved stats. More PSO Monsters - Monsters from Phantasy Star Online such as the Garanz, Chaos Bringer, and Olga Flow will appear in the game. Visual Lobbies - The online lobby system originally seen in Phantasy Star Online will return. Screenshot Functionality - Players will have the ability to take in-game screenshots. Pressing Select will activate Screenshot mode. After that, a player can take a screenshot by pressing the Start button. This is very exciting news for fans of the Phantasy Star Portable franchise! You can discuss this new details in this forum thread. As has been reported on multiple websites, the packaging for the upcoming Japanese budget version of Phantasy Star Portable 2 has revealed a possible expansion called Phantasy Star Portable 2 Infinity. Little is currently known about Infinity beyond the fact that it will let you import save data from Phantasy Star Portable 2. Further details may become available when the budget version is launched on August 26th. Credit goes to NekoRul for bringing us this news. You can discuss this possible expansion in this forum thread.